The Higher Purpose Hero Series is a new, monthly feature that showcases the stories of real-life “Heroes” — men and women who, while brandishing a defiantly positive and determined mindset, are pursuing their dreams in spite of potential adversity, criticism, cynicism, or being misunderstood by those around them. The individuals showcased in this series have different beliefs, goals, and mantras for how to live life, however, they provide valuable lessons in unlocking your inner potential. I am very blessed to have had these “heroes” come into my life and I hope their stories can help in your own personal journey. he·ro 1. a man or woman of distinguished courage or ability, admired for his/her brave deeds and noble qualities. 2. a person who, in the opinion of others, has heroic qualities or has performed a heroic act and is regarded as a model or ideal. Karen Lundgren is a hero. A graduate of University of New Mexico, Karen was an NCAA All-American and member of the US National Team in the sport of alpine skiing. Always a stellar athlete and empowering leader, Karen recently became the 13th woman in the world to conquer the Seven Summits and the 8th American woman to conquer the North Face of Mt. Everest. She is also a compassionate and loving mother that empowered her 13 year old son, Jordan Romero, to become the youngest person to summit Mt. Everest! Happy Women’s History Month! Be Your Own Hero! 1. You are viewed as a source of inspiration to millions of people around the World, becoming the 13th woman in the World to complete the Seven Summits and the 8th American woman to conquer the North Face of Mt. Everest. What are your short and long term goals moving forward? I want to use my platform and notoriety to share with other women and kids. My goal is to build more training camps for women that focus on connecting the mind and body. While the camps might have a focus on the physical elements of mountain biking or paddling, they will promote a mind/body connection that can be carried over to any aspect of life. I believe that women are strong and powerful, but sometimes are unable to grasp their full potential. Unfortunately, many women weren’t taught about sports and the outdoors and I want to share the beauty and peace that I have discovered throughout my life. I also want to continue working with kids as I am intrigued by Cross Fit and designing kid specific training for both mind and body. I want to get my Cross fit certification so I can be more knowledgeable and implement an efficient system for kids that builds a strong foundation for their future endeavors. Oh, and I want to stay fit and continue to grow and be stronger in my 50’s than I am now! I want to prove to the World that 50 really is the new 30! 2. What lessons have you learned about the power of mindset through your own experiences as an All-American skier, world class adventure racer, mountaineer, and Mom? Was there a particular moment in your life where you began to realize that by confronting your fears and “perceived” limitations that your potential was unlimited? Do you believe that all people have the ability to become their own “hero”? Through Adventure Racing most of all I have learned the power of the mind. When I was a kid and in college I hadn’t quite figured it out. I let a lot of people influence my image of myself and that negatively impacted my athletic performance. In college I began to figure myself out a little bit more, but in reality it wasn’t until I began adventure racing that I learned that the body is merely following the perceptions of the mind. I began to understand that I was in total control of what I was doing and that was all that mattered. That is a powerful realization and something that we all must grasp! I always believed in myself but once I stopped letting others change who I was then yes, my potential was unlimited. Can everyone become their own hero? Absolutely, but only if you believe in yourself! 3. Do you have any special practices that have helped you with confronting adversity? How have you implemented these practices in your daily life? Can’t say that I’ve implemented any special practices… Just try to LIVE my life every day, one moment at a time. 4. What are the greatest lessons that you have taken from mountaineering? 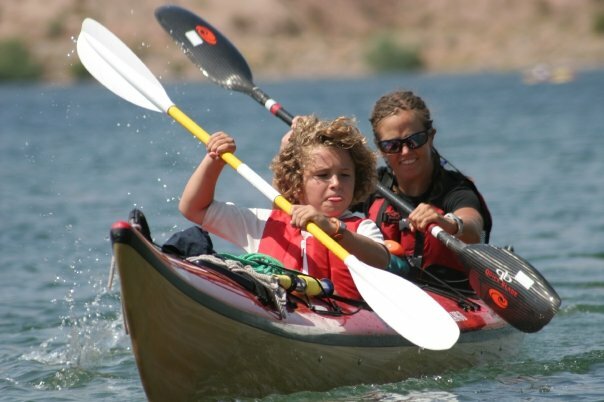 What lessons have you tried to teach your step son, Jordan, while tackling the Seven Summits? Mountaineering is all about teamwork and preparation. It’s often a slow moving process so you have a lot of time to think things through. Mountaineering is different every time based on people, weather, time of year, however, the mountain itself never changes. It’s quite predictable in various ways that you can prepare for if you plan properly. If you prepare for every scenario, think things through, have the skills to adapt to things that you haven’t thought of AND if you are PATIENT, you can climb ANY mountain. Teamwork on the mountain is HUGE. That’s one of the biggest things that I’ve tried to help Jordan see and understand because it’s not only important on the mountain it’s important in life. We talk about team all the time, about using every teammates strengths and understanding their weaknesses as well. The power of a team versus a group is immense. A team will conquer a mountain together, however, a group of egos will have a difficult time confronting adversities and will scatter themselves along the trail and fall short of their goal. 5. As an inspirational figure and role model to so many people around the World, how would you define a good leader? How has your perspective of leadership evolved since conquering the Seven Summits? I think that leadership is about leading by example. A leader isn’t the person who says they are the leader before an expedition starts, a leader does what’s needed and does it in a way that helps other people to reach their highest potential. 6. What would you suggest to people who lack a sense of purpose? What do you think holds so many people back from pursuing their passions and confronting the adversities along the way? I think people don’t think about it enough. It’s easy to do nothing, to just go along from day to day in the same routine. Instead I tell people to think about things and write it down. Writing things down creates some level of personal accountability and then as you tell more people you will begin to communicate your thoughts and take the necessary steps to bring the goal to life! People want to support other people who are passionate and pursue goals! The world definitely works in mysterious ways! 7. You have accomplished some pretty amazing things over the course of your life. Is there a particular event or experience that has proved to be the most rewarding? I have found that all of my experiences have formed one universal understanding. It’s not about one event or one experience, it’s about connecting the dots between the different lessons you have learned over the course of the adventure! Karen Lundgren is the strongest woman (both mentally and physically) that I have had the opportunity to meet in my life. At 14,000 ft she helped me to better understand why she is called”McGuyver”, repairing Kyle’s wheelchair with sun tan lotion! I am so glad to have met Karen along my path so please follow her adventures and advice through her company, 4 Seasons . Be Your Own Hero!